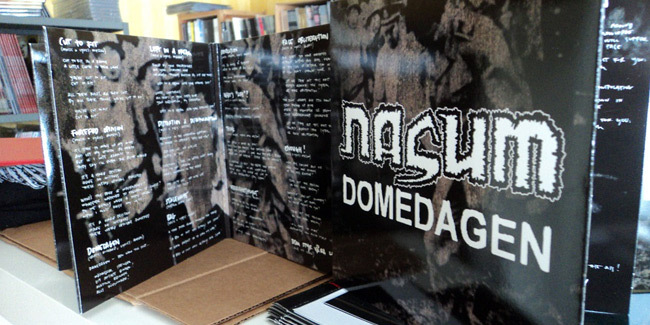 This year marks the 20th anniversary of Nasum's one and only demo - "Domedagen". This demo was our forth recording, and although it might seem slightly strange to release a demo just all of a sudden, it was all Regurgitate's fault. They did a tape, so we did one. The fourteen songs included two cover songs, two re-recordings and ten new songs, where the best ones were re-recorded for the "Industrislaven" MCD. In a way you can see "Domedagen" as a pre-production as it was recorded with a bunch of fellow sound engineer students of Mieszko's who had no knowledge of grindcore. It was a fun recording, but perhaps not all that serious from our part. The result became a rough recording that we copied to an unknown number of tapes (not that many, to be perfectly honest) and spread around the world. Power-It-Up contacted me and expressed an idea to release it as a 7" EP for Record Store Day 2014. I liked the idea - although "Domedagen" once was a tape and now is a part of "Grind Finale", it has never been a record of its own, and a 7" EP sounded like a cool idea. So I accepted their offer and begun working on the artwork. I started with the original demo artwork that Mieszko put together and decided to go all punk on it and did all the additional work by hand. It seemed to fit the recording. Two of the editions are exclusive to Power-It-up and Nasum.com and pre-orders will be taken shortly. There will also be a small edition on cassette, limited to 100 copies. The master used for the 7" EP version is the same as on "Grind Finale" and there are no additional, new material, apart from the packaging and Power-It-Up's patch. And additional information about the original release is found here.